Greetings and well wishes to all for the New Year. As we commence 2014 with a New Moon in Capricorn, this signifies a sober opportunity to create emotional stability, and to build our future on the foundations of the past. This includes rebuilding and developing new structures on a sound base. In the Archaeology of the Soul, there are basic beliefs and values which humankind holds in common, our true foundation. It may be that various structures, individual and international, which are not true to Plan, are overdue to Fall. How to rebuild is the ultimate challenge. My mentor, Beth Gray, always said: ‘change is inevitable – it is resistance to change that causes the pain’. The troubles that confront each of us, manifest minute by minute on a world scale, mirrored on countless screens in surround sound, everywhere, result in this single inevitability: change. In Reiki, we have a benign mortar to secure, brick by brick, our own daily embrace of change for the good. Through distant healing, we can contribute the energy of loving kindness to far horizons, in 2014 and beyond. Many thanks for your contributions and commitment to continuing the Work. This is a red kangaroo, standing at a place with two billabongs, with cabbage palm trees growing nearby. The kangaroo has been moving around them as shown by its tracks. The black cross patched areas represent the country. 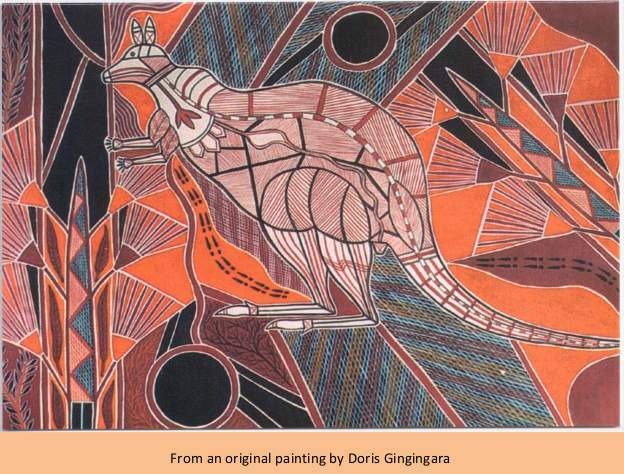 In timeless symbolism, the painting depicts how, with every bound, the kangaroo leaps into the future, following its destiny, surviving climatic and geological change through the aeons, always true to itself.